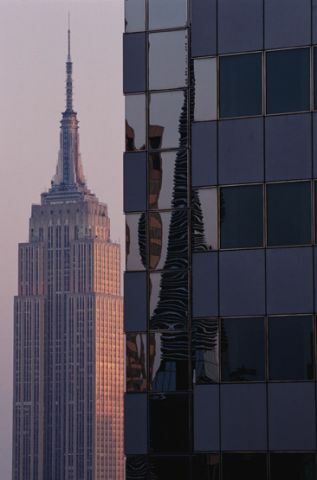 The Empire State Building is synonymous with New York City. The city's skyline is instantly recognizable because of this 1,454 ft (443.2 m) building in midtown Manhattan. This familiarity has doubtless led to its starring role in movies such as King Kong and Sleepless in Seattle, just two of the most well-known films among dozens which have featured this famous landmark. The tower glows with various themed light displays throughout the year, celebrating special events and holidays. Since its completion on November 13, 1930, almost 110 million visitors have taken in New York's breathtaking skyline from its two observation decks on the 86th and 102nd floors. Currently, over 3.5 million tourists visit the building each year. • New York - Find travel information, maps, tourist resources, and more photos of New York. • Empire State Building - Visit the official Internet site for this New York City landmark.